Any ideas on whether to use synthetic on my new 11 Kioti45Se? I am thinking of changing over to synthetic as I sue this in pretty much everything else. The Kioti manual doesn't reference it one way or another. Syn holds its properties much longer but gets just as dirty so it's not a good idea to double the oil-change hours. It can be made in a much wider viscosity range, so the 5/50 is what you need when you start in way-below-freezing and end your workday slogging in the tropics. I definitely wouldn't recommend using the synthetic oil until the break-in period is complete. Everything I have heard and read says that dead dinosaur oil is preferable for break-in. It's also way cheaper, particularly if you change it after the first five hours and again after twenty hours to get rid of the extraneous bits of metal, casting sand and dirt that are invariably in a new engine. After a hundred or two hundred hours is plenty soon enough to make the switch. For your location there in Wake Forest, I'd recommend the 15W-40 rather than the 5W-50. Running that low a viscosity in 32°F temps won't provide sufficient lubricating film strength. The 40 weight will be fine for your highs of 90-95°F, too. The synthetic oil thing gets kicked around here every so often, there are those who swear by it and those who swear at it. My belief is if your owners manual calls for synthetic then by all means use it, if the OM makes no mention of it I wouldn't spend the extra money. 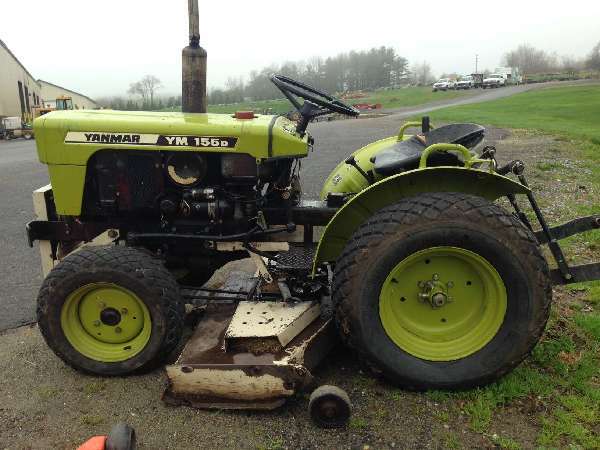 By simply using the oil and filters recommended in the Om and doing it on a timely manner there are few compact tractor owners who will live long enough to see and engine worn out from normal use. Can't speak for Kioti, but I was told by the dealer that my 2011 John Deere had synthetic oil in the engine when I bought it. I have a good supply of 0W40 and 5W40 (Mobil 1) that I use in my both my turbo diesel cars. As such, I have no problem - mechanically or financially - using it in the Deere too . Again, can't speak for Kioti. But the new Deere doesn't have a "break-in" period like the older tractors and vehicles did. The first oil/filter change on this is at 200 hours (or yearly). So given that I'll never change more frequently than once a year, it makes sense financially for me to use extended life synthetics too. Long story short, find out from your Kioti dealer what was in it from the factory. Make your decision from there. The OM doesn't make a reference to synthetics at all that i could find. This could also be an argument that it doesn't matter one way or another. Yes, with no reference in either direction it would seem to give you the option of using either one unless these OM's were printged long enough ago that synthetics weren't common yet. I wouldn't be concerned about harming the engine by using the correct synthetic to match the specs called for in a regular engine oil, i just would doubt you would ever recover the value of the extra money spent. i just would doubt you would ever recover the value of the extra money spent.Frank. I don't know what the extended oil change interval for a Kioti might be Frank, but I disagree with your idea about value. I have two turbo-diesel cars, in which I use synthetic engine oil. I change oil and filter at the manufacturer's recommended 13,000 mile interval. At case rate (6-pack) I pay about $6.45/qt and maybe $10 for the filter. It's an 8 quart change. That amounts to about $62 every 13,000 miles or $23.85 every 5000 miles. Mercedes says it's ok to use conventional oil too, but that means going to an oil/filter change schedule of every 5000 miles. Shell Rotella-T 15W40 costs about $12/gal around here, and it takes two gallons. Filter still costs $10. That's $34 every 5000 miles. Plus labor times 3 if you don't do it yourself. No reason the same math shouldn't apply to a tractor. I don't want to start the old synthetic/regualr oil feud going again. You believe in it, I don't, you like Pepsi, I like Coke, to each his or her own, nuff said there. My only comment on your post on using the synthetic in your cars is that perhaps you log up a lot of miles in a hurry that doesn't allow the oil to be in the engine long enough to collect the acids and other contaminants that come with long streches between oil changes. I spoke in the thread here about oil change intervals for compacts that I don't like going into a winter with old oil in an engine whether it has ran 10 hours or 90 hours since the prior fall. In my case as an example had I used a synthetic with a double the hours change interval I would have changed the oil four times since the tractor was new in 1999, the tractor has about 850 hours now. That would have meant going into at least three winters with old contaminated oil, no thanks. I had the wifey pick up the filters and oil today. Will put them in in the next couple of days. That and check all the bolts/nuts. 15w 40 is what they said was in it and their recommendation for our area. This is pretty close to what I use in everything else (10w 40) I doubt the difference is noticeable. Anyhoooo I am off and running. So why would you change your oil when it hadn't reached a certain number of hours as mentioned above. Seems to me that would be a waste of money. The idea I thought is change the oil when its dirty.